London, the capital of the British Kingdom, is one of the most popular tourist destinations in the world. The British Metropolis, which is situated on the River Thames, has something to offer to every tourist, regardless of his/her budget. Central London, the oldest district, hosts some of the most important tourist attractions and monuments, such as: Tower Bridge, Tower of London, St Paul’s Cathedral and British Museum etc. But, the heart of London also hosts more modern buildings, such as: the Swiss Re building (known as “The Gherkin”), as well as the Millennium Bridge, also called the “Sword of light”. Perhaps the Millennium Bridge is not one of the most spectacular bridges in appearance, but the feeling that you have when you cross it is absolutely unique. Due to its design, the bridge has no poles, fences or walls that can block your view. So, you wake up suspended above the River Thames. London Millennium Footbridge’s official opening was on the 10th of June 2000. This monument, which marks the millennium, was the first pedestrian bridge which was built across the River Thames in more than 100 years. The steel bridge, with a height of 325 meters, was designed by the architect NormanFostera and the engineer Ove Arup. The bridge opening ceremony included a march on behalf of the Foundation “Save the Children”. Still, there was a problem: the participants of the march felt the bridge shifts literally beneath their feet. 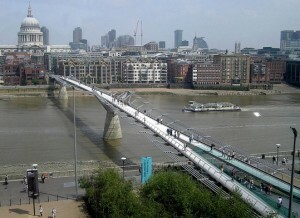 The Millenium Bridge that connects Tate Modern Museum to St. Paul’s Cathedral, was closed in less than three days after his inauguration in June 2000. The steel bridge designed especially for pedestrians had a small problem that became acute when it was crossed by so many people: the bridge began shaking disturbingly loud. Millennium Bridge was reopened in February 2002, after designers attached to the construction devices that relieved the vibrations of the steel and made them less noticeable. The bridge was closed again for a short period of time in January 2007 because authorities feared the storms of that winter might throw off the bridge the people who crossed it. If you decide to travel by taxi from Heathrow Airport to Millennium Bridge, EC4V 3PA, you can use the services of 247 Airport Transfer. The estimated duration of a taxi journey is 1 hour. A taxi transfer from Heathrow Airport to Millennium Bridge costs a minimum of 41 GBP for a Saloon car that can carry up to 4 passengers, 2 check-in bags and 2 handbags. You can get a 10% discount if you register at 247 Airport Transfer’s Website. – The transfer from Luton Airport to Millennium Bridge starts from 57£ for a saloon car. – The transfer from Stansted Airport to Millennium Bridge starts from 57£ for a saloon car. – The transfer from London City Airport to Millennium Bridge starts from 33£ for a saloon car. – The transfer from Gatwick Airport to Millennium Bridge starts from 58£ for a saloon car. – Heathrow shuttle services for low fares.